Distinctive features: One of the first of a series of calculators marketed under the Remington name, known for its typewriters and computers. Display is 6 digits, green fluorescent tubes. Main integrated circuit - Hitachi HD32154P (date coded 3F 5). 80 mm x 153 mm x 40 mm (3.2" x 6" x 1.6"). Although only displaying 6 digits, it calculates to 12 digits. The least significant 6 digits can be transferred to the display by pressing the "Right-arrow" key. A product announcement for this calculator claimed "Power supply is from four replaceable manganese alkali batteries which will last in continuous use at least 20 hours. A mains adapter is an optional extra." Calculators of this period were power-hungry! The 661, on the left, was Sperry Remington's first hand-held calculator, though the 661-D was introduced soon afterwards. The 661 has a different case and keyboard design, but otherwise appears to be very similar, though is much less commonly found. 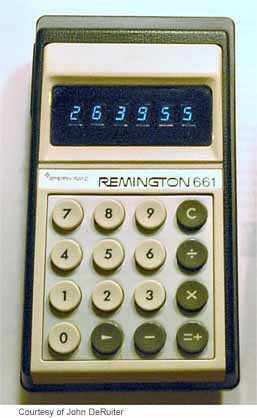 For more information on Sperry-Remington calculators see the article "From ENIAC to Calculator" in the Collecting Calculators section of this site. There were many calculators which, to save cost, only had a 6-digit display (the Royal Digital III only had a 4-digit display!). Most also had the extra key to reveal the less-significant digits.